Lakshmiheaters Energy Saving Ceramic Band Heater have ceramic band heater with 15mm or 25mm thick Ceramic fiber insulation blanket. 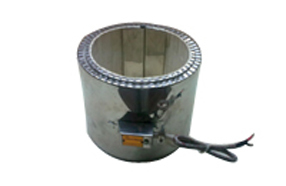 These heaters are designed for higher operating temperatures with maximum energy conservation. These heaters are, in effect, high temperature electric furnaces capable of very efficient heat transfer by conduction, convention and radiation. Heaters with various terminal options are also available. Clamping for the heaters is by bent-up flanges. Reduces Power Consumption of heaters by 25-30% thereby reducing Electricity bills by 10-15%. Reduces initial heat up time of machines. Working atmosphere remains cooler for the operator. Lakshmiheaters Manufacturers & Exports Energy Saving Ceramic Band Heaters, Energy Saving Heaters, Energy Efficient heaters, Heaters with Insulation Jackets, Heaters for Plastic Processing machines, Heaters for Injection Molding machine, Heaters for Blow molding machine, Heaters for Plastic Blow Film machinery, Heaters for Blow film Extruder, Heaters for Plastic process manufacturing, Heaters for Barrels, Drum heaters and Heaters for Plastic Recycling machines.